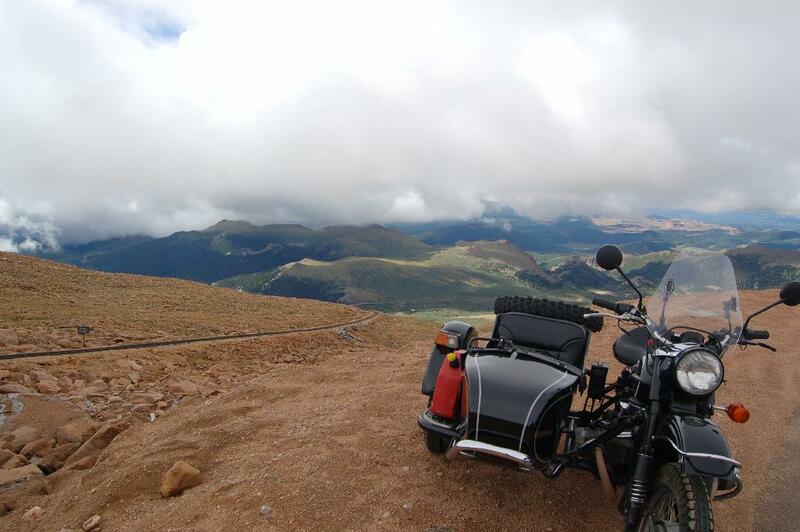 Natasha, my Ural Sportsman sidecar rig and I, had attempted three times to ride to the top of Pikes Peak together. The first time was back in November of last year, and we ended up being stopped a bit after mile marker 16 of the 19 miles to the top! 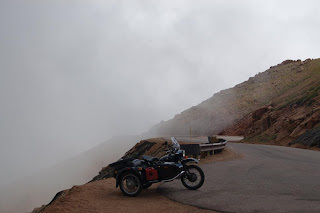 The second time I tried, the sign at the toll station said that the road was only open to mile marker 13, I didn't even ride up. Today was the third attempt, and as they say, third time's a charm. 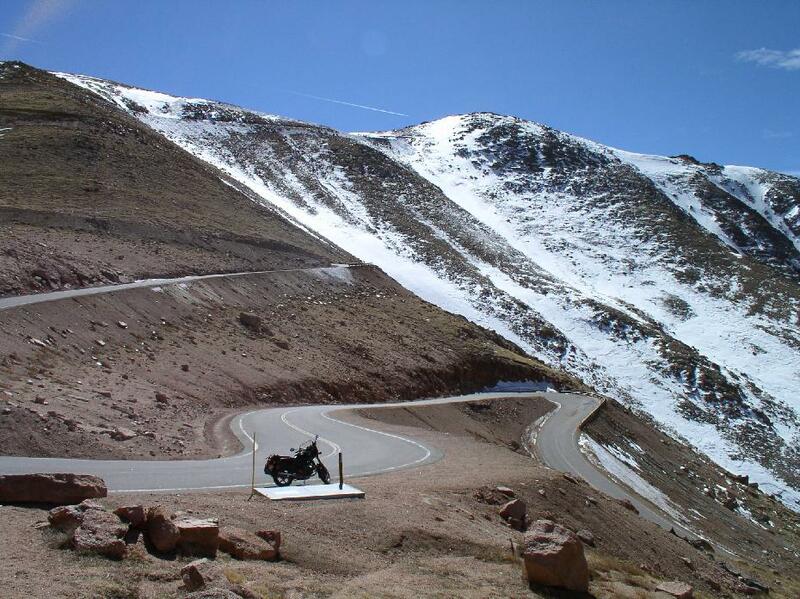 Or course, being the middle of summer helps too in terms of no snow blocking the road to the top! I left home around 7:50 AM and it was at 9:42 AM that I got through the toll booth and did a check-in with my loving wife before heading up the 19 miles to the top of the mountain. 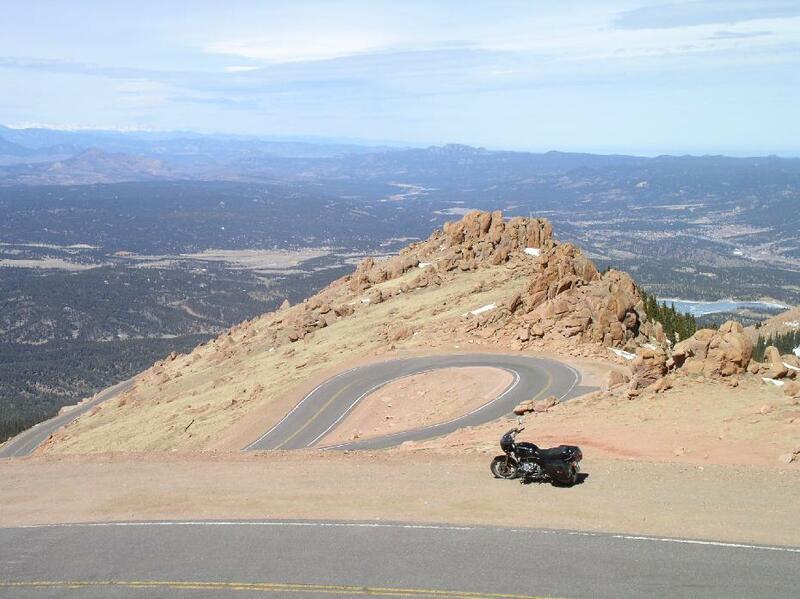 Traffic was light on the Pikes Peak Highway and road conditions were good, even on the dirt portions of the road since it had apparently rained pretty hard the night before, so no dust. Plenty of gravel and sand washed down from the sides of the mountain though, but being on three wheel, no big deal for Natasha. 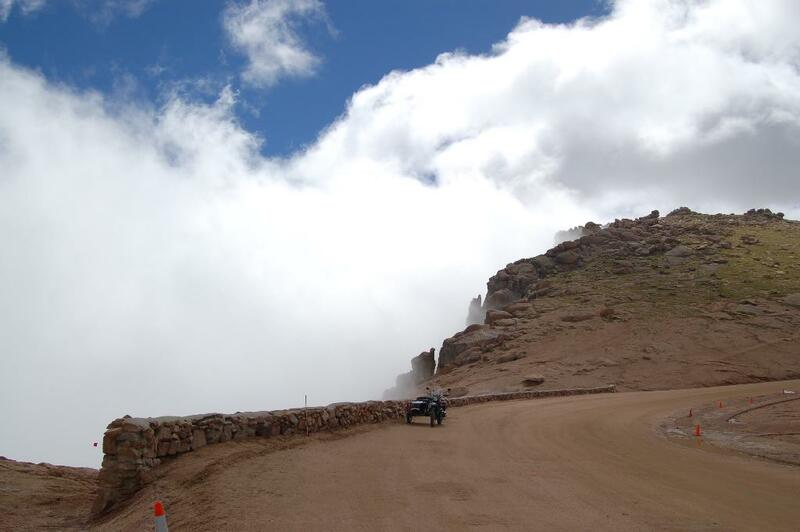 As you can see from the first picture above, the top of Pikes Peak was shrouded in clouds today. I took it as a good omen since it's kind of barren up there above the timberline when there's no snow, the clouds would add a foggy effect to the shots. I hit the "cloud line" shortly after I crossed above the timberline. 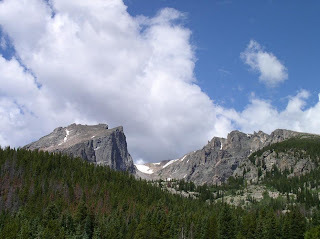 This was the view just before the 12000 foot marker. One of my favorite spots to photograph, the Boulder Pile, as I call it. It had always been snow-covered before so I'd not seen it. Natasha at the peak, finally. 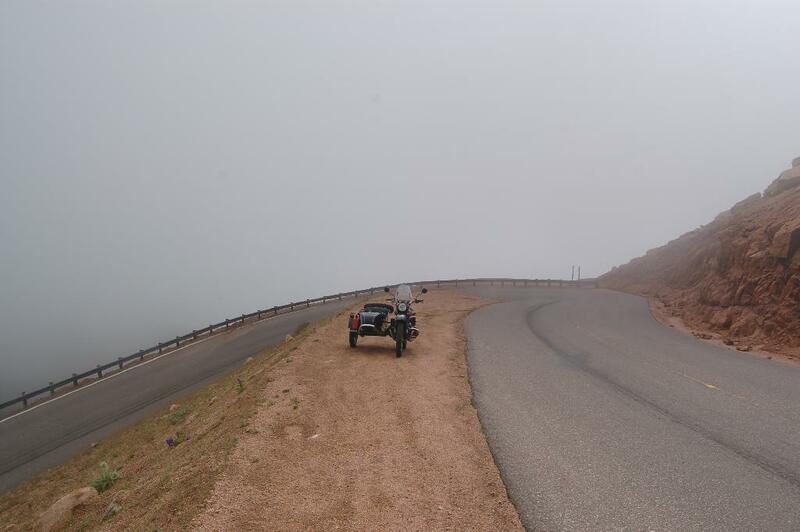 There really was not much to see up on top, what with the clouds and all so I started heading down the mountain. I must say, the cars seemed more aggressive on the way down and I found myself pulling over a lot to let them get by. Or, perhaps they had no idea how to put their car in lower gear and were burning up their brakes! I stopped at this spot being graded for hikers and parking, that had a view of the Crystal Lake Reservoir. 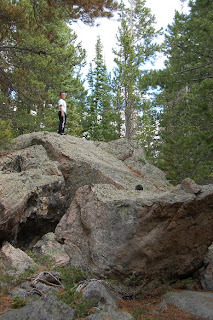 Nearing the Boulder Pile, I always stop for this shot. As I stood next to Natasha in the spot above, waiting for a line of cages to clear the shot, one of them paused and took a picture of me of all things! I waved, they smiled and yelled "Nice Bike!" Here's a shot of Natasha in November of '09, quite a difference eh? On the way home, instead of retracing my route on CO83 to Parker, I swung east of Colorado Springs on US24 and took the road north to the small town of Elbert. 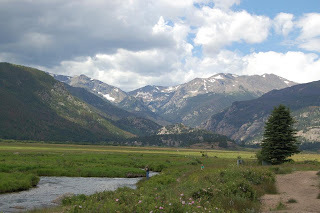 I wanted to get a look at the green prairies and lush wooded areas of the eastern portion of the Front Range. The ride home was without incident and in very light traffic. Got home a little bit before 4PM, perhaps 200 miles of riding in about 7 and 1/2 hrs of saddle time, a good ride. 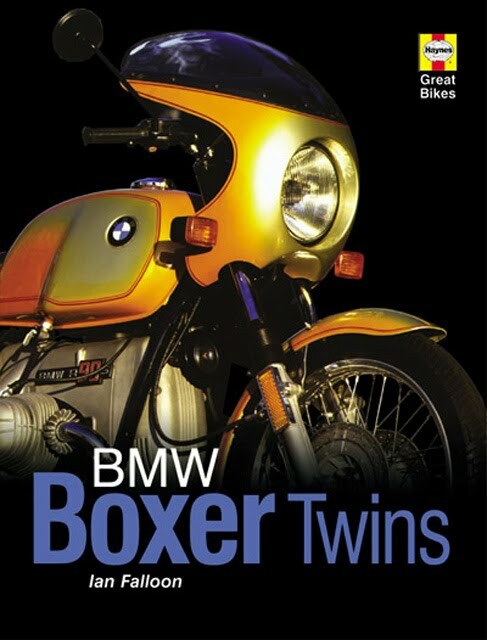 As a follow-up review to my first book review for motorbooks.com, I give you my impressions on Ian Falloon's book on the legendary Boxer Twins from BMW. 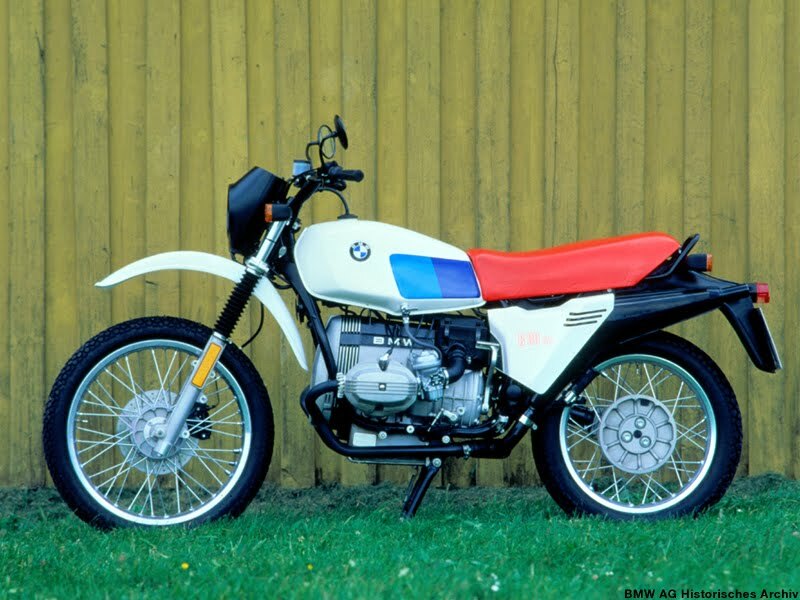 Bottom line: This book has more technical specifications per model year of the Boxer engined motorcycles made by BMW than you can shake a stick at! Along with great photography of BMW racing models and productions models, it's a great guide to the many models and designs stemming from the R32 all the way to the R1100s motorcycles. The book is laid out by year, introducing each model that was produced for that year. Technical specifications and differences between succeeding and preceding model years are listed in comparison charts. Highlighting of significant changes or improvements are detailed including why they came about. For the technically minded wrencher comparing BMW motorcycle models, or even the basic wrencher as yours truly, this book is a great guide to finding out the differences between model years. Having this book can give one a fair start at becoming one of the Beemer Cognoscenti! This book also caters to the motorcycle racing enthusiast who is biased towards the BMW Marque, giving great technical details and photography of the racing heydays of BMW in the late 20s and 30s. The RS model designation was an attempt to tie in the model to the Rennsport racing reputation. The bleeding edge technology it introduced in its "wind tunnel designed" fairing marked the true beginning of today's continental-distance crushing sport-touring motorcycles. The R80 G/S "Gelande / Strasse"
The book covers the models and changes made up till 2004 when the book was published. 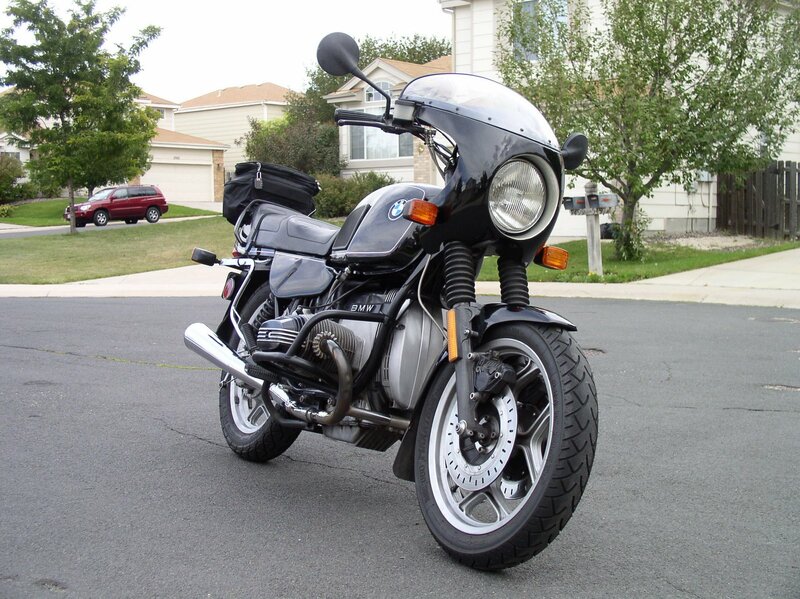 It's not an exhaustive compilation of all the extensive motorcycling knowledge embodied by the BMW Marque but it's pretty close to what most Beemer riders/aficionados/cognoscenti will want in terms of a ready reference to the different models made by BMW Motorrad. The many great photographs of BMW's racing greats, the racers and the production motorcycles will draw the casual reader's eyes and the technical wealth of information should satisfy the average seeker of such knowledge. Highly recommend this book as your "field guide" to the made models of BMW motorcycle, specially if you're thinking of acquiring one as it'll tell you the subtle and not-so-subtle differences between each type and model year. If you end up acquiring this book, in part because of this review, please let motorbooks.com know you read about it here! 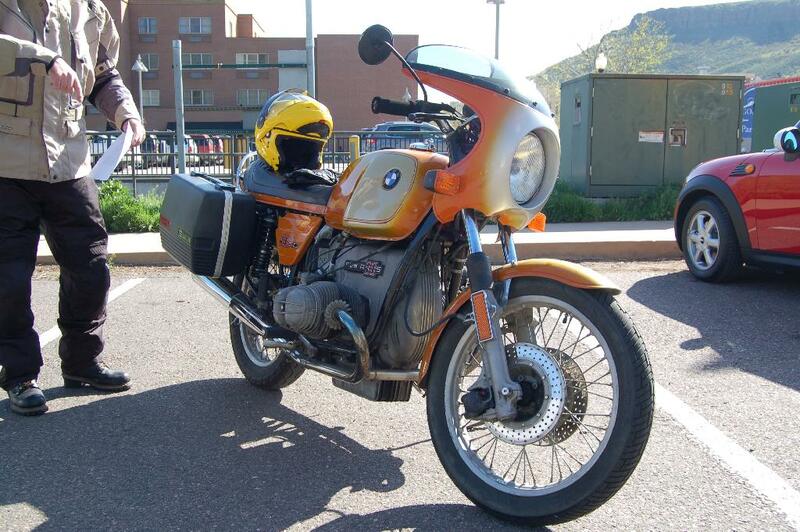 Recent events have led to my removing the S-Fairing that I'd mounted on Brigitta, my 1987 R80 Airhead Beemer. 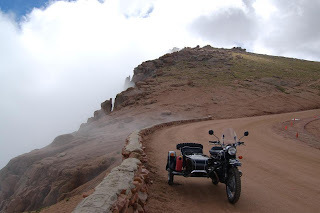 Here's some links to the history of the fairing and me: The start, the mounting, the farkling and the finish. So last week, while doing preflight checks (motorcycling is as close to flying as one can get and still have wheels touching the ground), I noted my turn signals were not working. Hmmmm, I checked fuses and yep, one was burned out. No problem, dug one out of my spares and put it in and rode to work, figured it was just that fuse's time to go. I get home from work and close to the house noted the dang turn signals were not working again. That's not good, I thought. Replaced the fuse and went for a short ride, this time I was watching the signals like a hawk and noted it went out while executing a left hand turn. Aha! Got her home carefully since when that particular fuse blows, it also takes out my brake light! Put Brigitta up on her centerstand and starting checking wires for bare sports, looseness and such. Got things to the point where it'd blow the fuse each time I'd move the wheel over to the left. Aha! Now I can replicate it, so I can narrow it down. Much checking, wire bypassing/jiggling/examining later, narrowed it down to the wires leading into the left fork and through them to the front left turn signal housing. To do all this, had removed the S fairing so I could see things better and also access the wiring inside the headlight bucket. 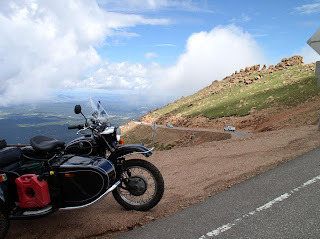 Carelessly, I had in the process of removing the S-Fairing, allowed one of the "hot" wires leading to the voltmeter in the S-fairing's dashboard to lie exposed against the steel braided sheath of the right side brake line. You know where this is going right? I turned on power to continue troubleshooting and the wire formed a hot contact with the brake line and smoke ensued! Dammit! It got hot enough before I pulled it off that it melted a hole in the rubber hose encased by the steel braiding and caused a leak. Now I had no front brakes. Berating myself as I continued troubleshooting the wiring issue, I could not find an obvious worn-through spot in the wires. I did find though that in all my pulling and pushing of the wires, I must have moved them past the point where it was grounding and causing the short circuit. I wrapped them all in new electrical tape, put everything back together sans the S-fairing just in case I had to tear things apart again. Whatever was shorting things out is no longer doing it. I would have loved to have found a bare spot on a wire but I'll take the return of working turn signals and brake lights. So, to the question posed by this posting's title: Naked or Bikini. I ask you, my faithful readers, which do you believe is best: Run Brigitta without her fairing or "naked", or put the fairing back on? 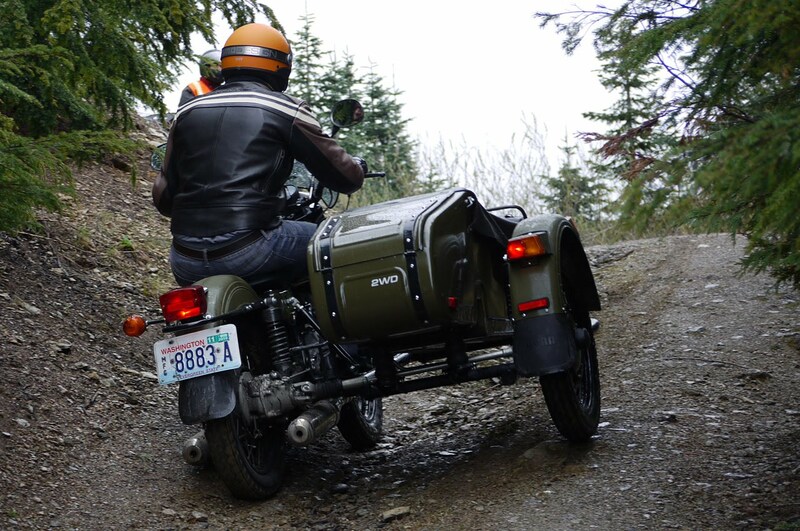 Autoblog.com has posted a very positive review of their experience with riding the 2010 Ural Patrol Sidecar Rig in the wilds of Northwest Washington State. I invite you to their posting to get a non-sidecar rider's perspective on what its like to ride these beasts. The review is couched within the context of the reviewer nearly plumetting off the side of a mountain road while following an experienced sidecar rider. 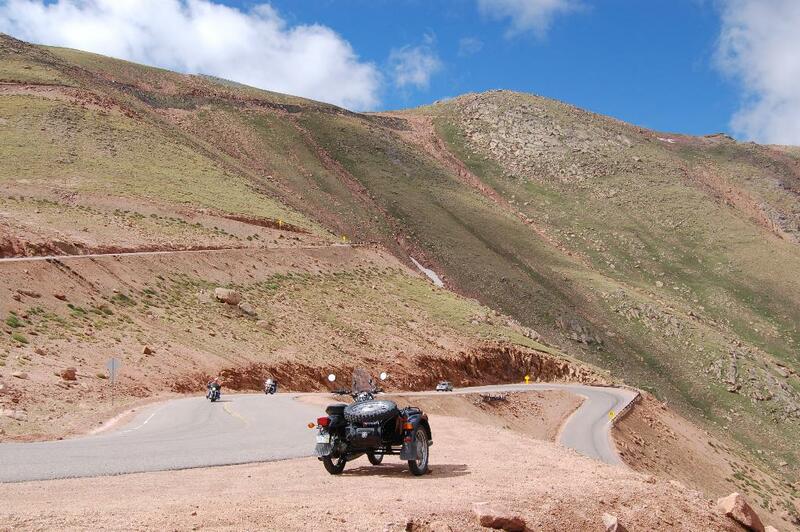 His experience and the lack of experience with sidecars that is mentioned by the author should be read and believed. Sidecars are truly worlds apart from two wheeled motorcycles and care and training should be taken with them. So, go read the full review, lots of good pictures there on autoblog.com, they did a nice job of reviewing the newest version of my own Ural Sidecar Rig: Natasha. 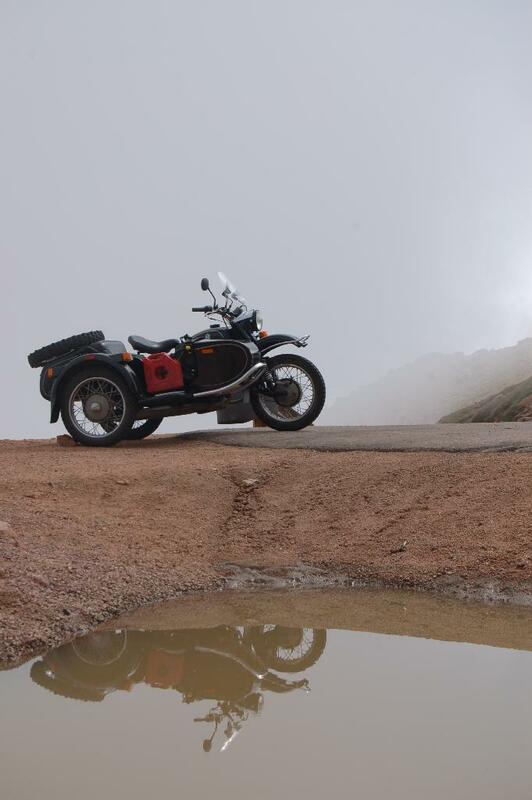 I will throw in this though, the reviewer from autoblog really was impressed with the 2WD functions of the 2010 Ural. My Natasha has FULLTIME 2WD as it comes with a differential! I've never been able to find out why Ural quit making the model with fulltime 2WD, go figure! I write this review with mixed feelings about the book and its contents. On the one hand, it's truly an epic journey which Emilio Scotto made on his Honda Goldwing motorcycle, circling the world twice and passing through damn near every country in the world! On the other hand, the way he did it, with a motorcycle that was truly unsuitable for some of the terrain he rode it on; sketchy finances at best, mooching his way through the globe and counting on the generosity of strangers is not quite the way I'd see myself doing the same thing. His perseverance and seemingly indomitable will to continue the mission are quite admirable however. I would surely have turned back at several points in his journey. He's probably thinking, where the heck am I? There are large gaps in his account and periods of travel where no pictures are evident, just some brief verbiage accounting for large distances or several countries traveled. I mean, I could see why no pics from his start, he was robbed the third night out! Still, the gaps and short tales that he used to describe parts of his vast travels were annoying at times. Then again, the book is only 222 pages long, with more written stuff at the beginning and basically just pictures with short descriptions towards the end during his second riding around the world. The book also is quite the tribute to Honda Motorcycles design, workmanship and quality that they built into the Goldwing Motorcycle Scotto rode. 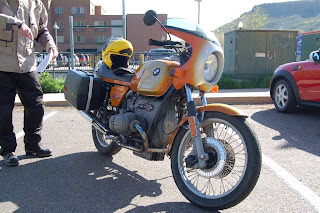 He sure didn't give me the impression he did much to take care of servicing her properly, rode her in really bad terrain, dropped her countless times, several crashes, lots of parts replaced and I think the engine was replaced at least once. Through all this, she kept on going where other motorcycles would have given up the ghost! Think of this book as a series of brief vignettes, sometimes with a picture or two to go with the respective vignette, that describe some of the major events he chose to account for the reader. 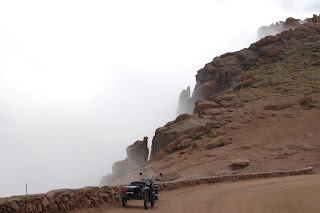 He confirmed for me that Africa is a continent I'll never ride in, his experiences there were pretty much negative in terms of border crossings, war, violence, and crappy roads. 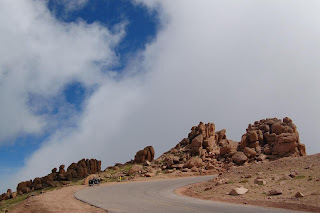 I wonder, what his wife (whom he knew before the trip, and then asks to join him during the journey) thought about all the romantic trysts he very briefly alludes to at the beginning of his journey northwards from Argentina towards the USA and thence to Europe. He gives the impression of being quite the ladies man, which apparently came in handy in order to get aid, lodging and such when riding damn near broke across the world. 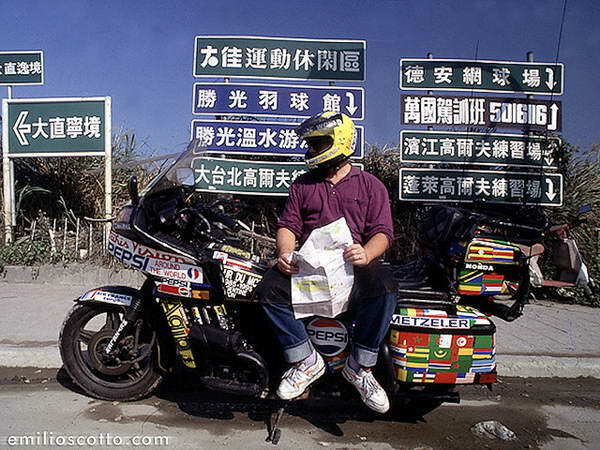 Still, after all the above, he did ride about 460,000 miles in the space of a bit over ten years! He's quite entitled to write the book any way he wants! 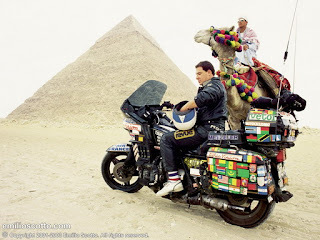 His journey started January 14, 1985 and ended on April 2, 1995, a decade on wheels exploring the world. He did this in the days before the widespread use of the Internet where one can seek aid and gather information easily for one's journey. This book, is an analog version (in my mind), of the current ten year voyage being done by a fellow sidecarist: Hubert Kriegel, he's on his sixth year of a ten year trip on sidecars around the world. Hubert is of course, different from Emilio Scotto is many ways, not the least of which is their selected mode of transport. 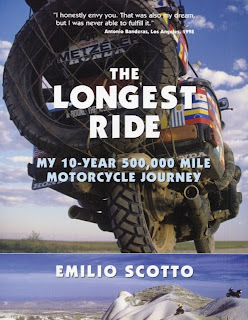 I feel more akin to Hubert than to Emilio Scotto and his way of traveling but then again, both are "riding their own ride", and in the end, that's really what counts. 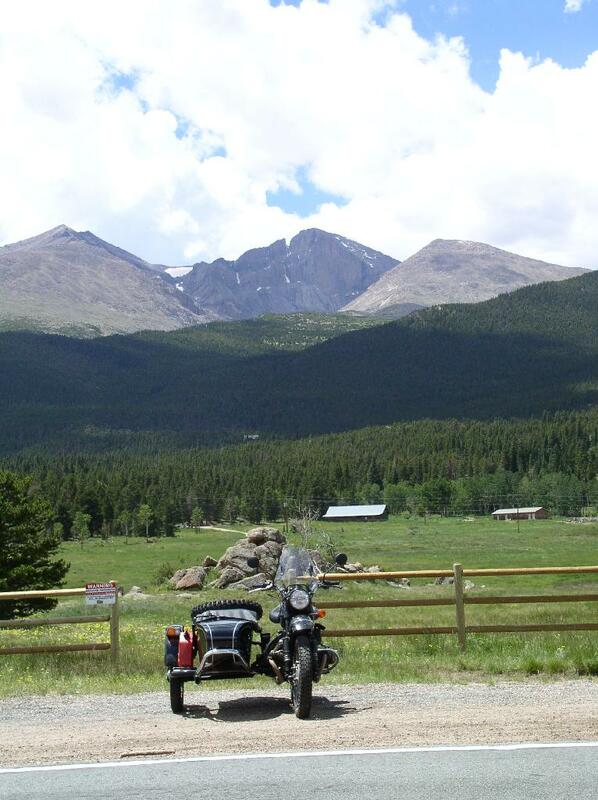 LINK to Hubert's Timeless Ride. If you end up getting this book in part due to this review, let the folks at motorbooks know will you? Yesterday, I was riding Natsha, my Ural Sidecar Rig home from work. 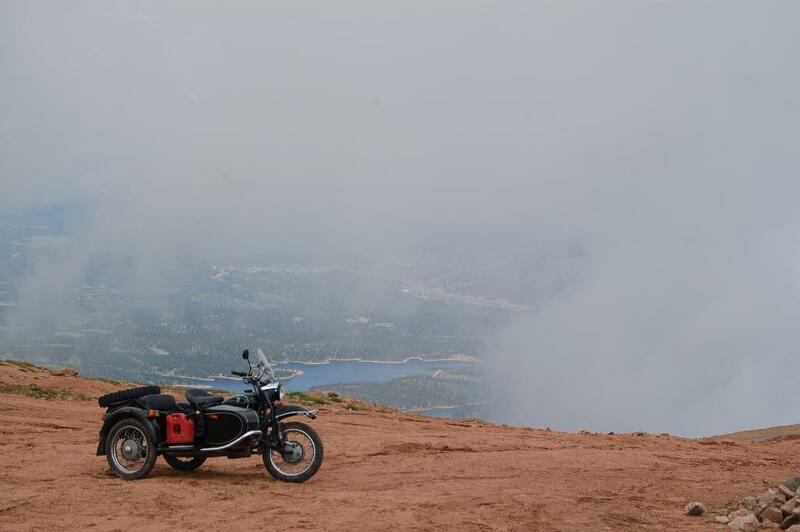 A few raindrops were falling as I started the 12 mile ride home, no big deal I thought to myself. It was raining so hard that our sewer drainage systems got quickly overwhelmed and rain started running in small streams along the sides of the roads. Cool stuff I thought to myself as I purposedly ran with the sidecar wheel closer to the curb to "engage" the stream and get some good splashing going as I rode along. Things got even more fun as the water levels rose, and it started collecting to about 8 inches deep or more at road intersections! The sewers just couldn't handle the amount of water coming down, you could even see whirlpools forming where the drains were! 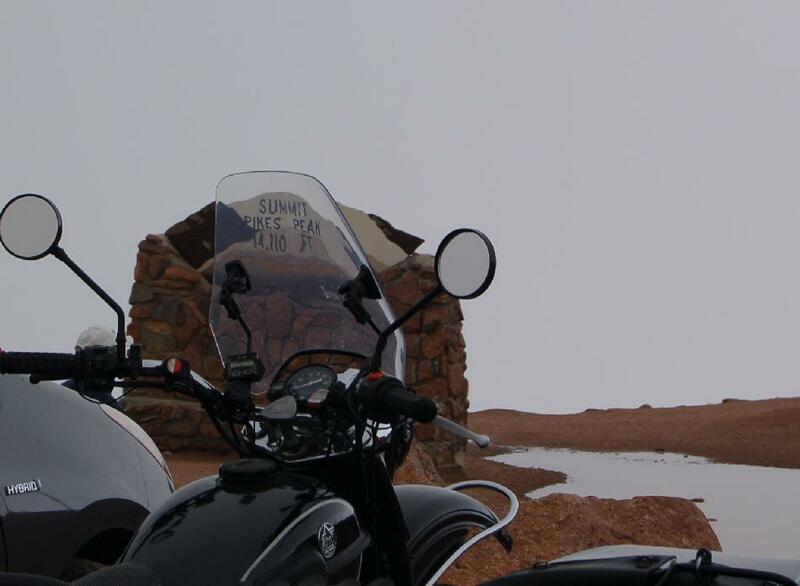 I'd not been out on a motorcycle in such conditions before, it was great! Natasha and her three wheels gave me the confidence to stay out, I was soaked anyways, and play around the intersections just outside my home neighborhood. The water was deep enough that as I forded some of the deeper portions of the intersections, I could see the water lapping the engine's jugs! At one point, I entered one intersection and gunned the engine. The water splashed up and OVER my head as I plowed into the pool of water. In fact, it killed the engine and I coasted forward a few feet out of the water pool. Natasha restarted easily enough and I continued playing for a bit. Lots of fun, finally had enough and rode on home. 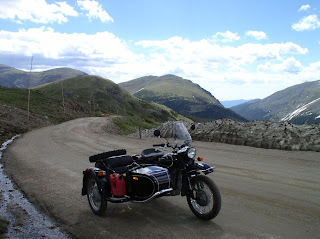 Too bad the boys weren't home, as they've been asking me for a ride to do "river crossings" on the Ural. No pictures, sorry, but it would have killed the camera. Miles, my number 2 son and I rode out of our neighborhood at 9:30 AM today. We were going into the foothills to try and escape the hot weather we'd been having lately here in the Denver Metro area. Note: This posting is also located on examiner.com. So what's the difference? I get paid per # of hits on that site, so if you feel like helping my fuel budget, read the article there instead: LINK, Thanks! 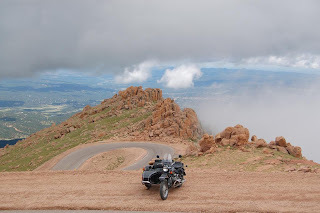 I took County Line Road west and after a brief sprint on the E-470 slab, got off at the Wadsworth Blvd exit. 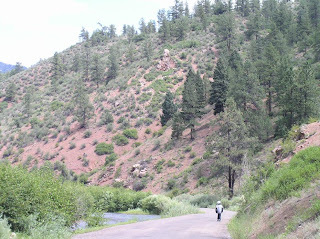 From there it was a short ride to Deer Creek Canyon Rd and the beginning of the foothills. There were dozens of bicyclists on this road but everyone rode according to the rules so the only disharmony was this squid who passed me on a double yellow line. Dang squids, I was even riding a few miles above the posted limit! 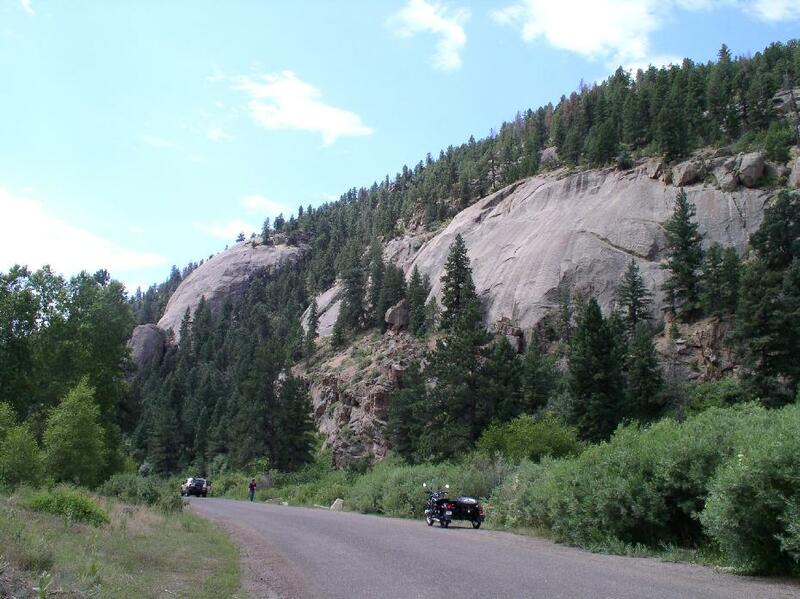 From Conifer, you can then take Foxton Road south, winding your way lower and lower away from Conifer until you reach the West Platte River. Here the road forks, with the right side going towards the small settlement of Foxton and the left leading you along the South Platte River Rd towards Deckers. Although most of the snow has dissapeared from the mountain peaks visible from the Front Range, the waters of the West Platte River were pretty high and running strongly with what I assume is snow melt as we've not had much rain lately. There were plenty of cars, campers and folks just out fishing or enjoying the cold waters of the West Platte River, this in areas where the current was not too swift of course. We came upon Dome Rock and I stopped for this picture of Natasha. Miles took this opportunity to go exploring along the riverbank. 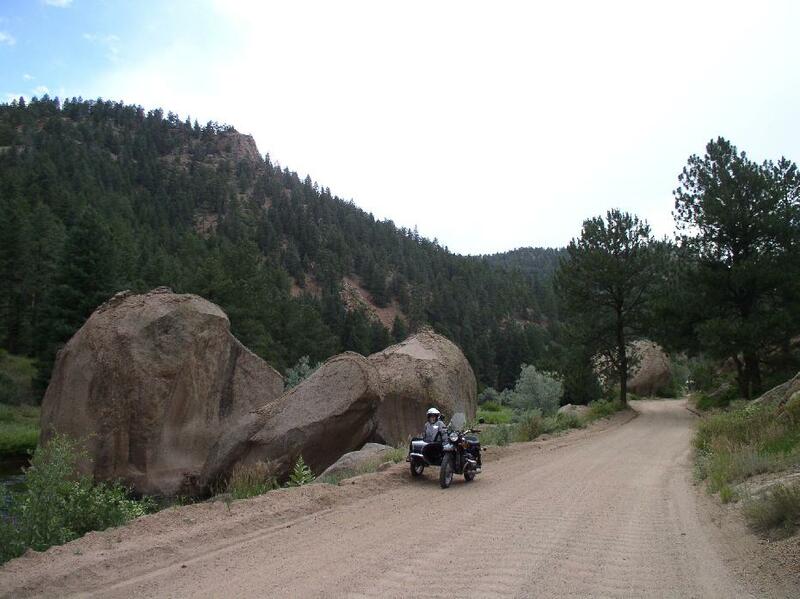 Miles and I continued riding Natasha, following the path of the West Platte River road until we came upon the site of the old and now abandoned South Platte Hotel. The hotel awaits restoration but it's been that way since I first saw it when Sanoke showed me the South Platte River Rd for the first time. 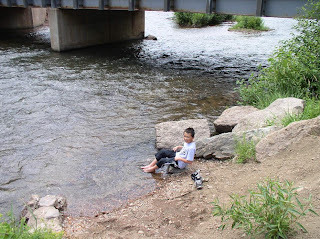 We parked Natasha in the shade by the hotel and explored the banks of the river where the confluence of the West Platte and South Platte Rivers form the now just plain Platte River. It was hot and a bit muggy, we left our riding jackets with Natasha and just wandered about the river bank. 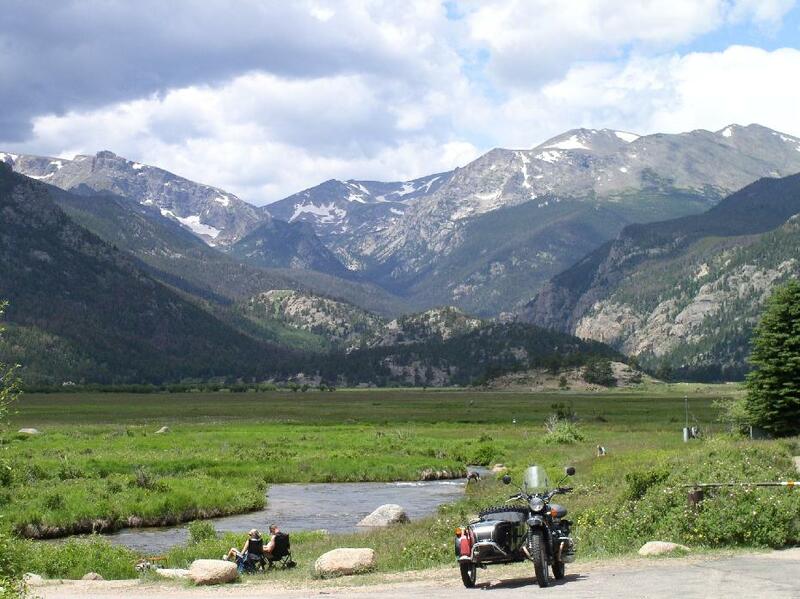 just south the South Platte Hotel. 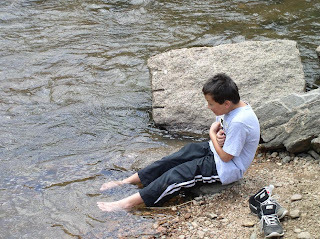 The water is apparently a little bit cold. We were starting to get hungry by now as it was a little bit after Noon. We got geared up again, after having sprayed each other with water to soak our T-shirts to help deal with the heat. It felt quite nice for a while riding with a wet shirt under one's jacket! One last photo at the usual spot by the big boulders sitting in the river. 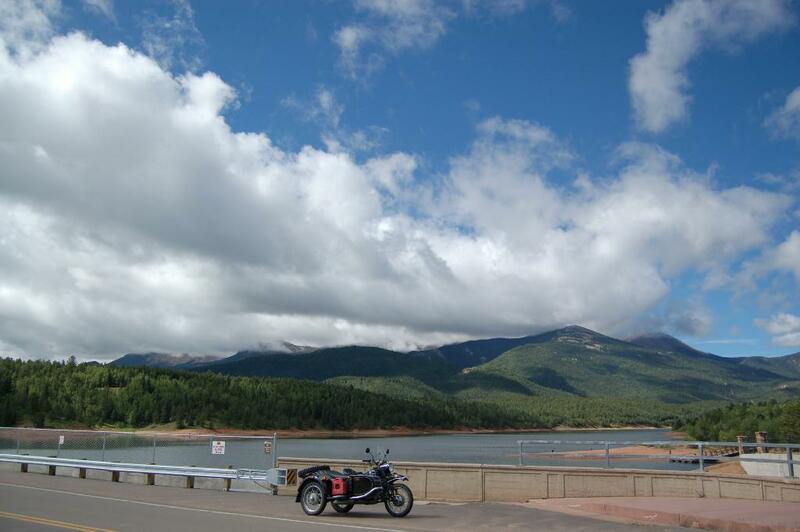 Instead of riding all the way to Deckers and then turning on CO67 back towards US285, I elected instead to take West Pine Creek Rd off of CO97 or Platte River Rd. 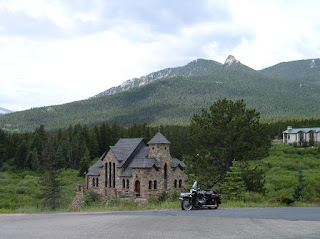 It was, the sign said, 17 miles to the town of Sedalia. I'd forgotten how washboarded some portions of this road are. There were times we bounced quite a bit when hitting these rough spots but Natasha did just fine. 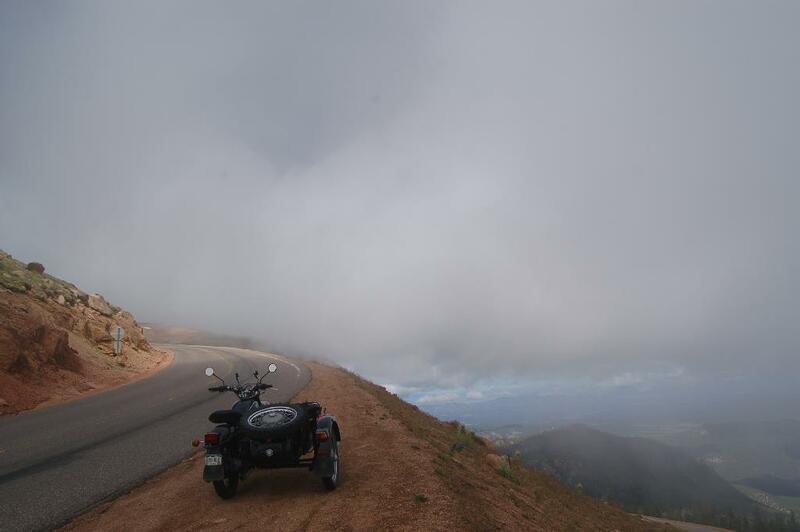 The skies were clouding over above us and I knew it was only a matter of time before it would rain on us. We ascended on Pine Creek Road towards its junction with North CO Hwy 67. We descended down towards Sedalia on CO67, with the final twists and turns of Jarvis Canyon being the final canyon carving we'd be doing for today. We cruised through Sedalia, and headed towards the city of Castle Rock We found ourselves a "Good Times" burger joint at the strip mall area at the junction of I-25 and Founders Parkway and enjoyed a late lunch. We headed back towards home by way of the Crowfoot Parkway which took us to the town of Parker. We got briefly rained upon on the way to Parker, Miles got to experience the stinging sensation of rain at 50 mph. I told him to imagine riding without a helmet and getting rained on, he got my point. We made it home with no incident by 2:30 PM, not much more over 150 Km's ridden today, less than 100 miles or so. Both Miles and Natasha did great. I recently arranged a deal with motorbooks.com whereby they'd send me books I showed an interest in and they let me review them in my examiner.com byline. 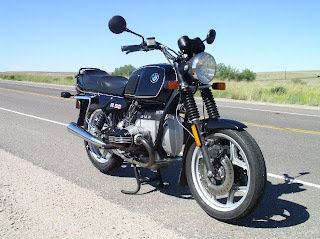 The regular readers of this byline of mine know I favor the BMW Motorcycle Marque almost to a fault so my first book review should come as no surprise to you. The book's author is Peter Gantriis and the wonderful photography is by Henry Von Wartenberg. It is a coffee table type book in that its main attraction are the beautifully photographed motorcycles made by BMW from the first model in 1925, the R32 to the 2007 R1200S motorcycle. All of them are beautiful machines in their own right. 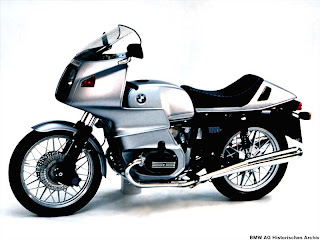 Now, while the photographs are great, the author's writings on the history of BMW and the particular tidbits of information on specific models is what makes the book a must-have book for any BMW Motorcycle enthusiast! Origins: The first motorcycles made with the BMW M2B15 which was the first version of the famed Boxer engine were the Flink and the Helios, both of which never caught on due to weak frames. The engine was loved but the frames were lacking. 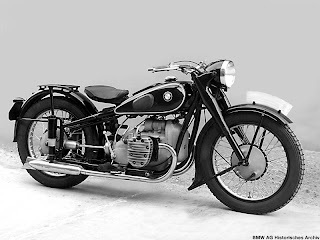 Max Fritz was given the job of designing a proper motorcycle frame by BMW and the result was the R32, it was the start of a legendary marque. The R32 was the first motorcycle to have the M2B33 (a descendant of the M2B15) side-valve boxer twin that produced a modest 8.5 horsepower. It was mounted transversely across the chassis, virtually the same layout used in every BMW Boxer since. Designed primarily as a sidecar motorcycle, the R71 was designated to replace the aging R12. Its power came from the familar side-valve 746cc engine fed by twin Graetzin carburetors. The final run of R71s was made in the spring of 1941, the exigencies of the war forced this line of motorcycles to end and the military version, the R75, came out at the same time that spring. 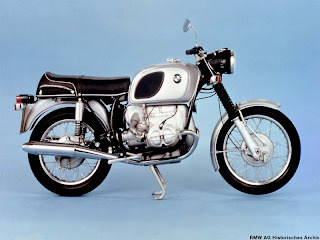 The r90S, BMW's high-performance flagship, appeared in 1974, and it caught the entire motorcycling community by surprise. With its remarkable new fairing and beautiful paint finish, the R90S set new styling standards-not just for BMW, but for the entire motorcycling industry. It is the R90S's style and flair that I sought to emulate by attaching an "S" fairing onto Brigitta, my 1987 R80 Beemer. 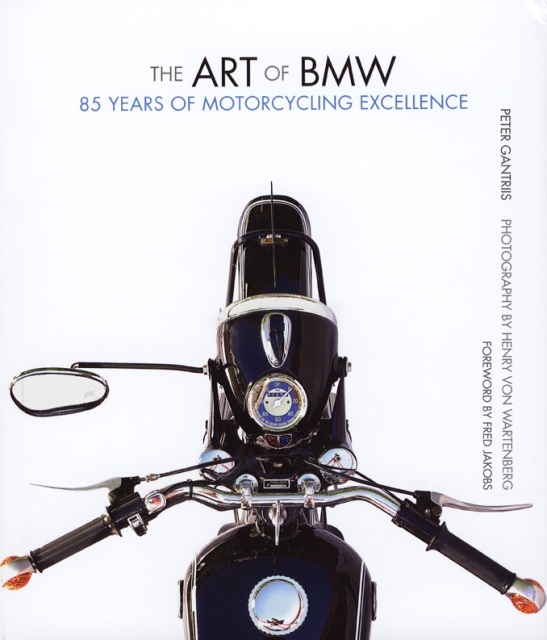 In sum, this book is the perfect coffee table type book for the motorcycling enthusiast who wishes to illustrate to non-cognoscenti the beauty he or she sees in the BMW Motorcycle Marque. Though some technical details are inherently unavoidable as you are reading about riding machines, the photographs take center stage for the reader. I will be reviewing other books about the BMW Boxer twin motorcycles, each book increasing the level of technical detail and complexity it relates to the reader. 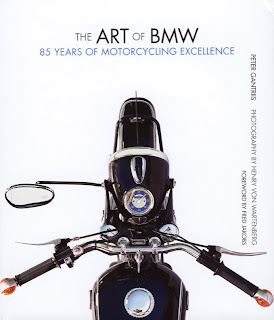 I see this book as the "gateway" book into the world of BMW motorcycles, it is "eye candy" for the motorcycling enthusiast in your life. This book is distributed by motorbooks.com, if you end up buying the book due in part to this review, please let them know. 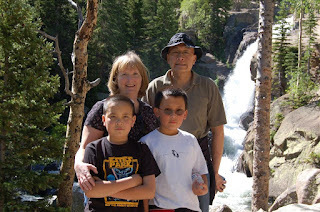 This past Sunday was the final day of our stay in Estes Park, CO as we visited the Rocky Mountain national Park (RMNP). 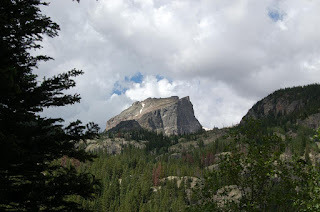 The day before, Saturday, had been spent riding up Fall River Road (dirt road that spanned part of the park before the advent of Trail Ridge road; and also riding up and down Trail Ridge Road to and from the tourist town of Grand Lake, CO.
Sunday however, the main objective was to do some hiking from the Bear Lake Trailhead, as a family. 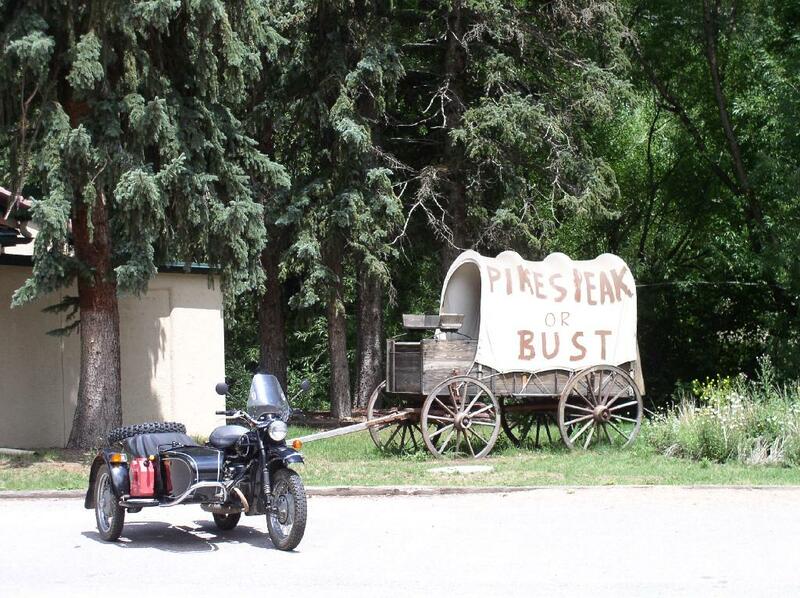 We rose early, had a quick bite and coffee and rode to the Bear Lake Trailhead's parking lot before it filled up for the day. 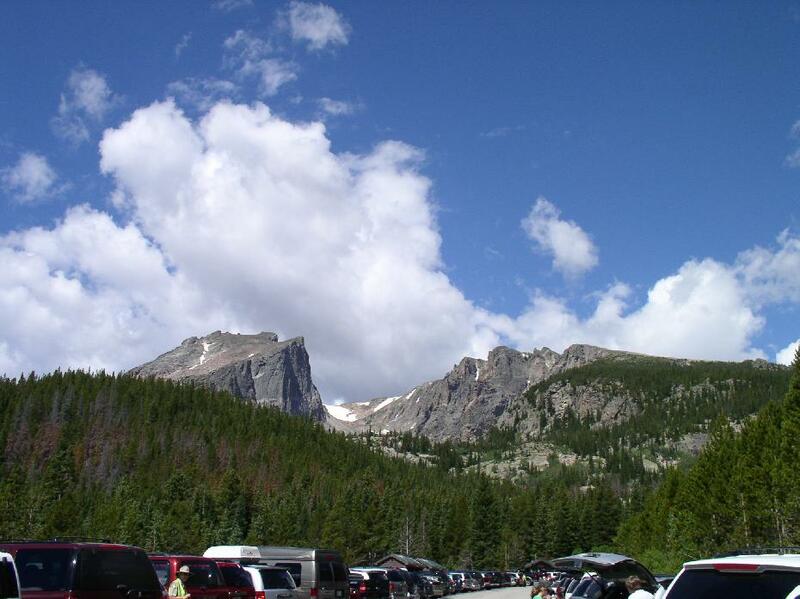 Note: the parking lots for all the trailheads seem to fill up quick on nice days like we had this past weekend, get there early if you can. I parked next to the family minivan and used it as a storage point for my riding gear. Once all four of use were ready, we walked up to the starting point for the trails. 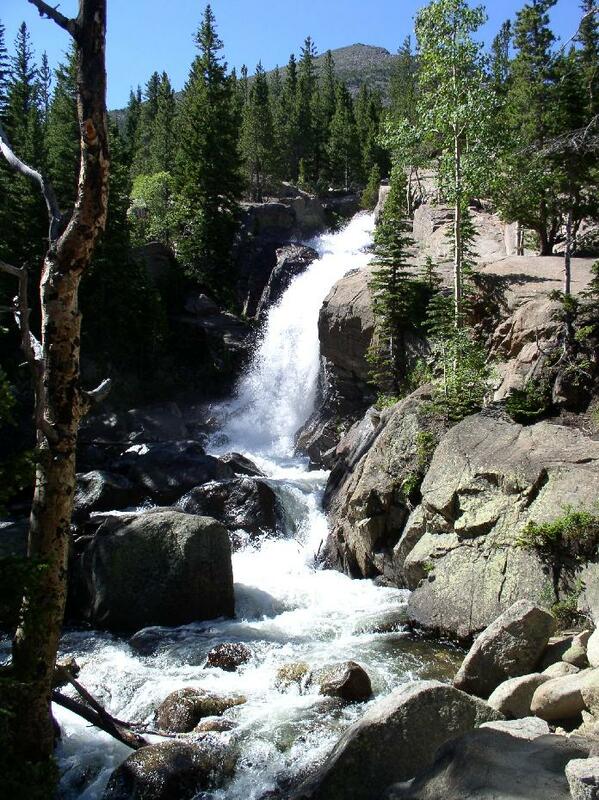 We elected to try the Alberta Falls hiking trail as it was about 1.1 miles to the falls. 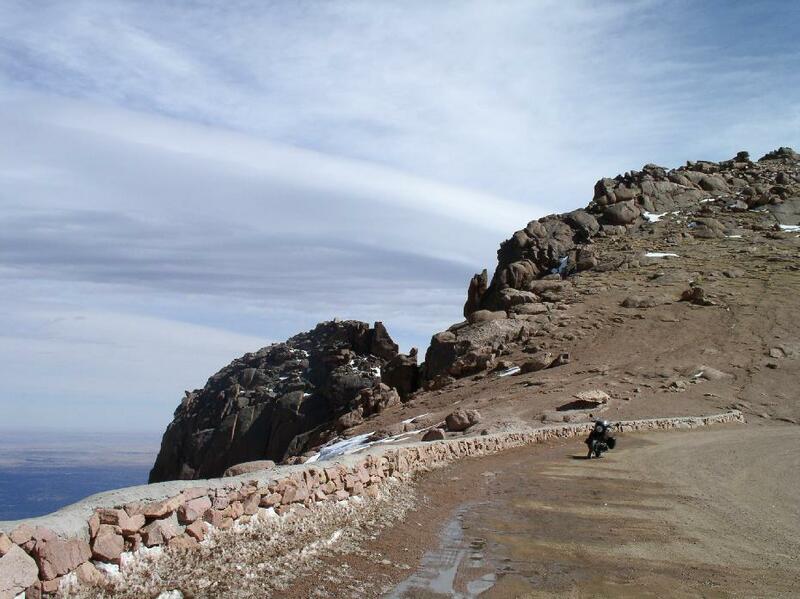 I have to say, next time, I'll wear hiking boot, my Oxtar motorcycling boots did fine but there was some "slop" in the boots. 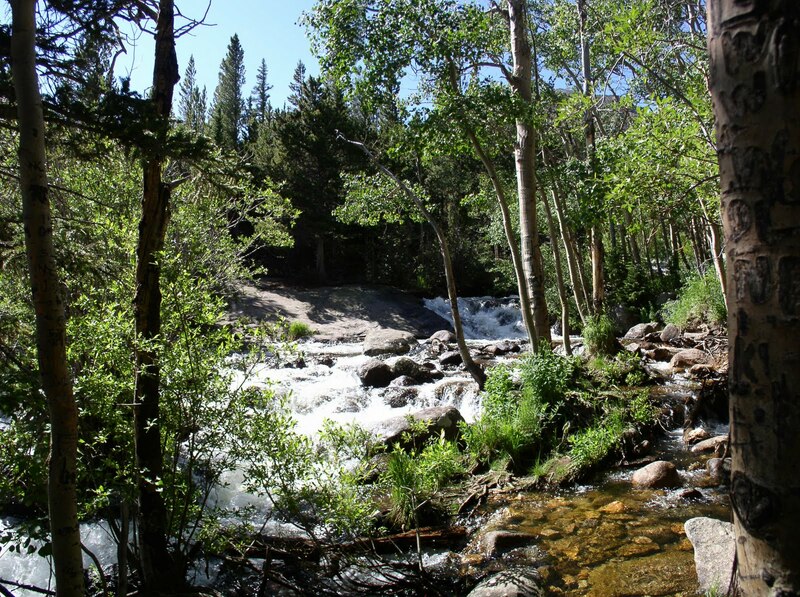 The trails run through thick pine forests so you're in the cool shade most of the time. Still, even in the coolness of the shade we soon were shedding our outer layer. 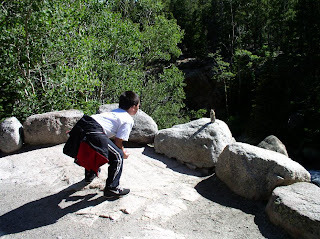 We walked with no rush, allowing the boys to climb the occasional rock as we came upon it. There were other folks on the trail but you didn't get that crowded feeling at all. The squirrel won by the way. These suckers act quite unafraid of the hikers, I think previous people have ignored the "no feeding the wildlife" signs and caused these squirrels to act like beggars. A few more feet and we were at the Alberta Falls, and they were quite the sight. 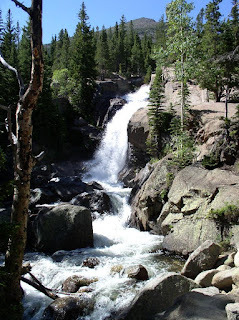 Yes, they are worth the short hike by the way. A short wait, with bathroom breaks worked in, and we got onto the pretty full bus for the short ride up to the Bear Lake Trailhead and our vehicles. 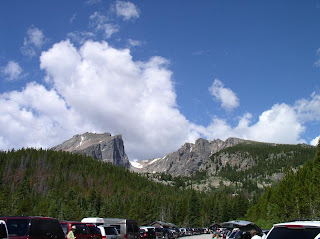 We broke for lunch at the minivan and watched as latecomers in their cars searched sometimes in vain for parking space. Did I mention you have to get there early? 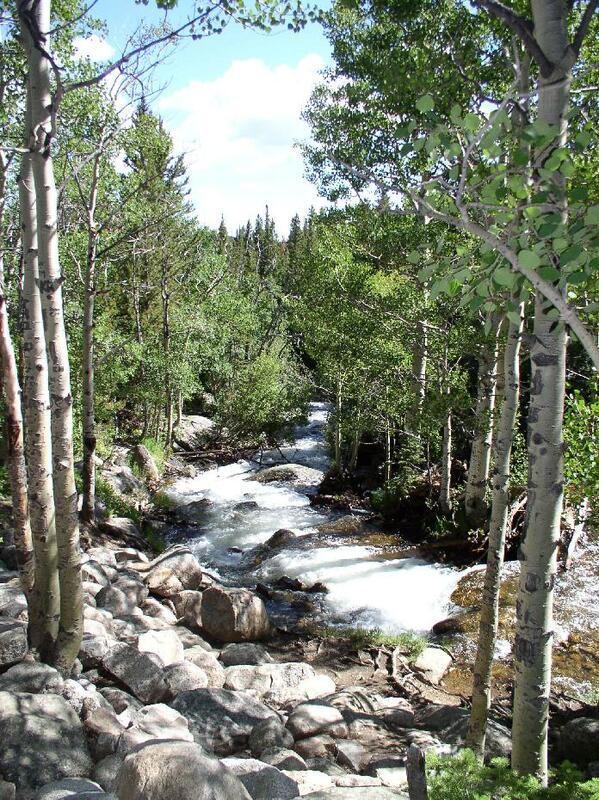 After lunch we went back and chose the less than one mile hike around Bear Lake. It's quite the nice lake and the path around it is well maintained and mostly flat. 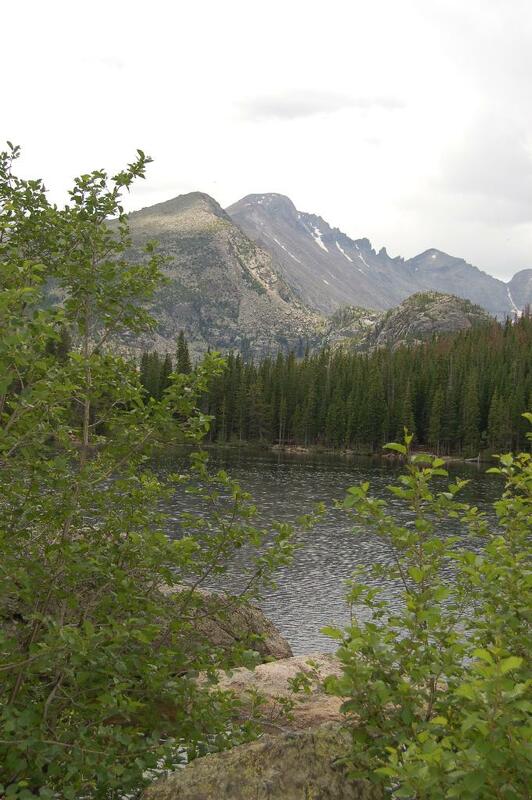 The predominant terrain feature, besides the lake itself is a nice view of Flattop Mountain. Marthacam: Did I mention Miles likes to climb rocks? 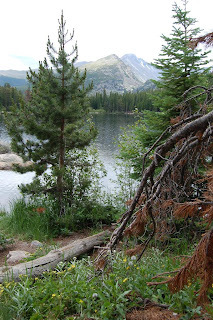 It rained light on us briefly as we circled the lake, quite refreshing actually. 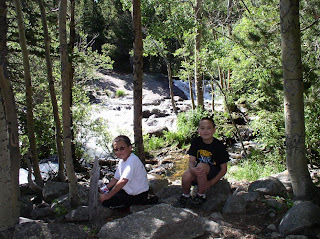 Soon enough we were done with the hiking and I geared up once again for the ride home while Martha got the minivan and boys ready for their ride home. 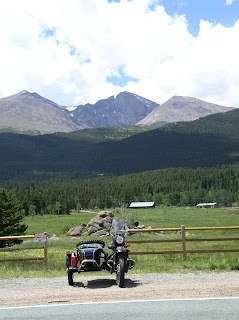 We both took the CO7 route out of Estes Park since it was more scenic being as its part of the Peak to Peak Scenic Byway. 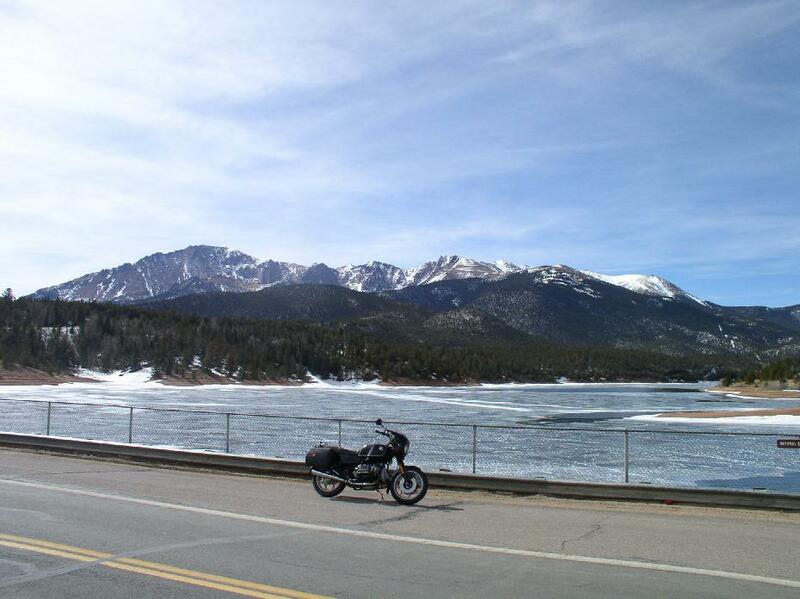 Road conditions were good, traffic was light and the weather was warm, it would get quite warm as I got to Denver. I made it home by 3:30PM, my wife and sons having arrived before me by about 30 minutes. Less than 300 miles of riding all weekend but I felt a bit tired nonetheless. Natasha however did great! No issues except for some minor backfiring when doing engine braking. 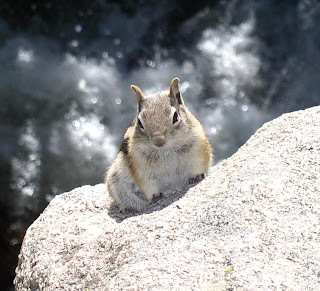 I hoped you enjoyed the photos of the trip to the RMNP by myself and my family.